Happy New Year everyone! Sorry I have been silent these past few weeks. I am happy to say that we are settling into our lovely new flat in Edinburgh. I met my work deadline this last week (though there is still tons to do but I have a more sane schedule--at least for now)! I really did miss sewing. In fact, I think time away from sewing exponentially increases my time thinking about sewing! hahaha....and I have been doing a lot of plotting and planning! 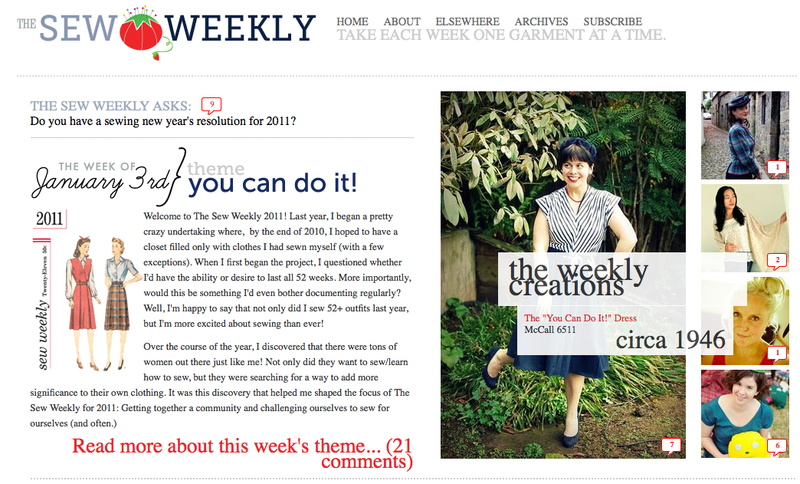 You may have seen but I have taken the 'Sew Weekly' challenge and am going to try and sew something every week for 2011. gulp. I am SUPER excited, a bit nervous, but ready to jump in! 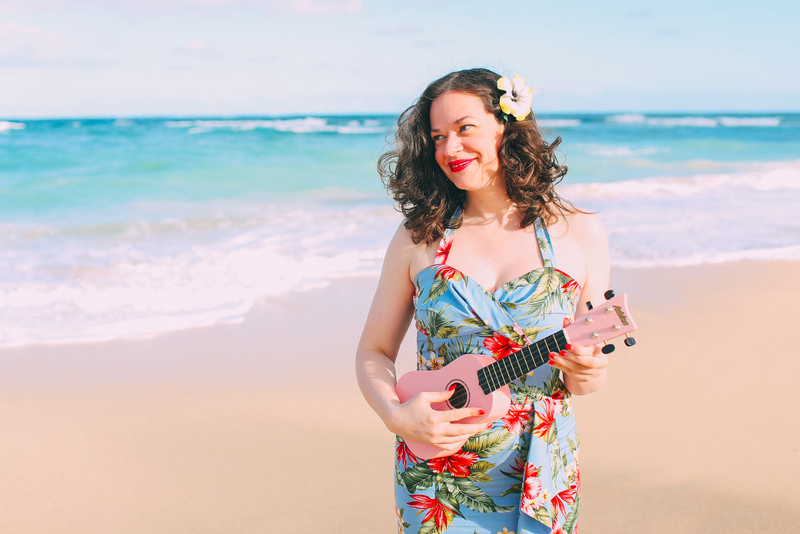 If you haven't already, check out Mena's new layout at The Sew Weekly blog. Every week we'll be trying to sew around a specific theme and everyone's invited! I was already thinking about a sewing challenge when I saw Mena's invitation. I have some really fun and exciting sewing plans--but more on that later this weekend! Yippppeeeeee...I am so excited to jump back into it! Can't wait to see more of your projects this year, happy 2011!! Glad you're back and hope you had great holidays! Your new place looks glorious! eeek I'm scared cos I've joined a sew something every month, not sure I'm up to the weekly challenge! hey, glad to see you back! You must have real sewing hunger. Every week? My goodness! 52 new pieces of clothing? I could never sew, store and wear so many things I guess. But I'm sitting front row watching you, I'm impressed already with you taking the challenge on. Good luck! Wow Debi, what a challenge! Can't wait to see your weekly makes, how inspiring!!! I already saw this on Mena's blog. I am so excited to see what you make, you lucky girl! 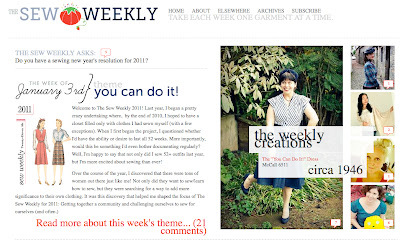 I can't believe it has already been a year since I started reading The Sew Weekly. Yay, am so pleased for you, and awed by you. I know for definite I'd never manage to make an item of clothing a week. I am too much of a perfectionist, and I procrastinate too much. Lol. Can't wait to see what you come up with. Not only are you back, you're back with a vengeance. Go for it! I am so excited about the Sew Weekly set up for this year. AND so excited that you, Adey and the other two ladies are an important part of it with Mena. For the rest of us it means big encouragement to sew.